Recently, a prominent producer of pet food came to Dorner with a specific goal: move their product from a processing machine to a bagging machine for packaging. Since the pieces of pet food were small, they needed a way to convey the product from various elevations without transfers to reduce the amount of product lost in gaps. In addition, they needed a way to feed two (2) separate baggers with only one conveyor, while at the same time being able to keep previously measured units of the pet food evenly spaced prior to the bagging process. Since they would be moving food, the application called for a certain level of sanitation, which called for a stainless steel framed belt conveyor. Engineers at Dorner proposed a stainless steel AquaGard Z-frame conveyor using a urethane belt with split cleats and adjustable lane guiding to separate the units of pet food. 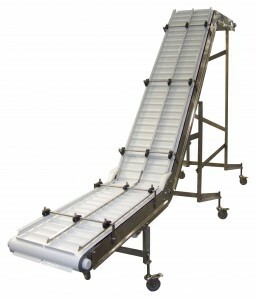 The AquaGard conveyor allows for frequent wipe-down cleaning and features an open frame to eliminate areas where pet food debris and bacteria could potentially build up and harm the product. Plus, the combination of the Z-frame configuration, split cleats, and adjustable lane guiding, allowed the customer to bring the product from the lower processing machine up to a packaging machine at a higher elevation while keeping the pet food separated evenly and reducing product loss by eliminating unnecessary transfer points. With the addition of the conveyor, this pet food producer was able to optimize their labor assets and provide accurate, consistent, and safe routing of their product.